The Recession hit hard, but unevenly, taking out some industries almost completely, while some prospered. Here's a chart looking at the impact of the Recession on 255 different industries — and how well they recovered, if at all. 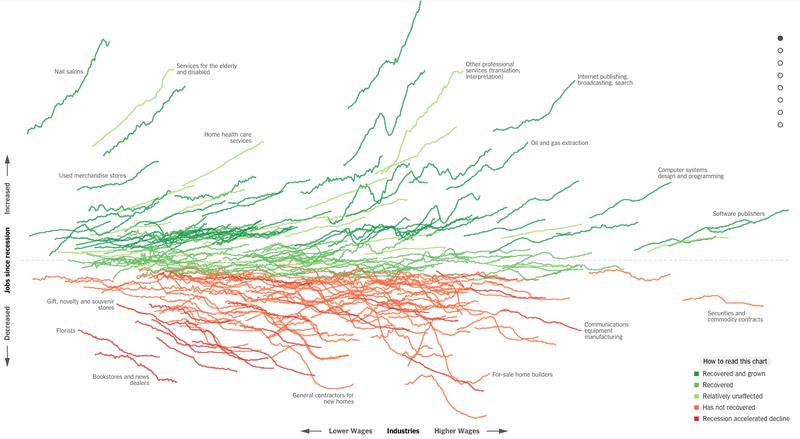 Jeremy Ashkenas and Alicia Parlapiano over at The Upshot put together this chart using data on the total number of jobs each industry had over the past 10 years — covering the periods before, during, and, critically, after the Recession. You can check out the full chart, which is interactive, right here. Is your industry represented on the chart? Tell us how your industry has fared, whether it reached recovery, and what you think the outlook for the future is.